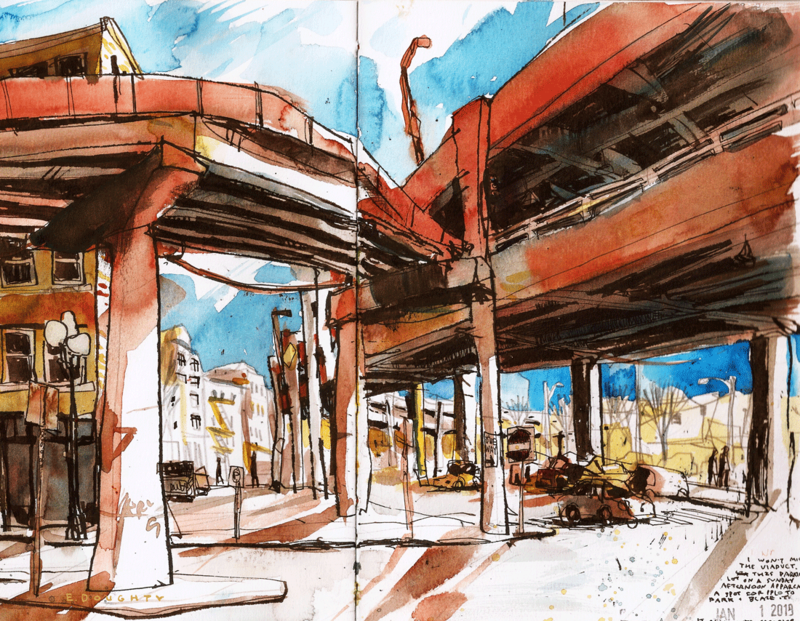 I went out and sketched the viaduct a couple times in late December & early January to pull in a last view of the cars traversing it, before it closed. It's kind of a big deal that this structure is just going away, it's a huge piece of infrastructure and a main route for traversing the center city! 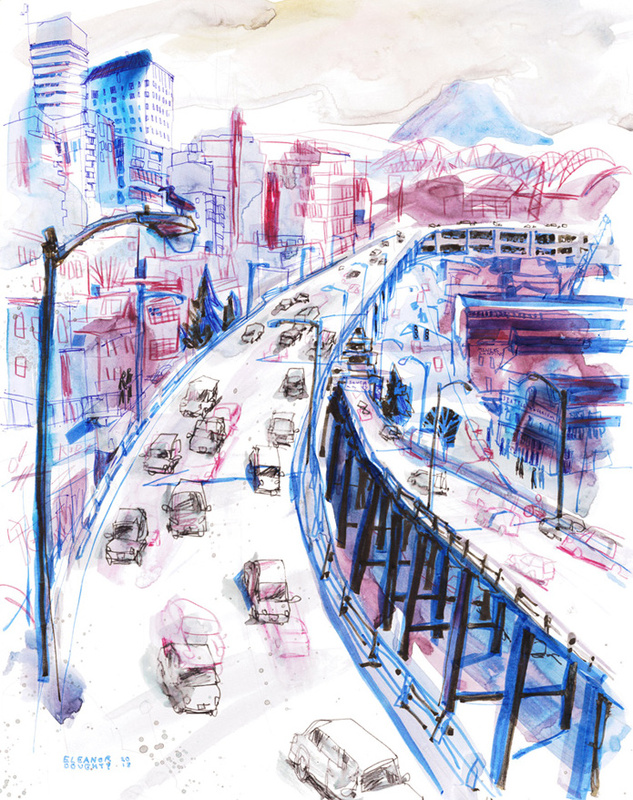 As I've lived in Seattle for only a year and a half, I don't have the nostalgia about Alaskan Way that others do. I've only been on it maybe 5 times. To me, it's a toxic structure that makes all of the waterfront street below it kind of dark, dingy, and loud...generally unpleasant to be nearby. Further south in the West Edge, it's all empty buildings, trash strewn everywhere, and generally creepy vibes. So to say the least, I was excited for the Viaduct to go away, but then I read that disheartening article in the Stranger about the new 6 lane road that will replace the elevated structure. Could it be possibly even worse than the highway?? I'll take that article with a grain of salt, but I'm not optimistic given how Seattle has dealt with its car culture til now. I went out to document these views feeling a sense of duty to preserve how it is now - before it changes forever - and I realized that it's not especially beautiful or interesting. R.I.P. A common refrain is how great the Viaduct views are, and how it was the "working people's view" of the waterfront. I get that it was a good view — I appreciate a good view! As a non-driver, and someone who is strongly anti-car in general, I think the waterfront here should belong to the people, not to cars. And there are still plenty of spots to appreciate the vantages of Elliot Bay for free, and it's way easier to take it all in when you don't also have to concentrate on not crashing on the highway. I think we're kind of spoiled for waterfront here in Seattle. If we put an ugly, loud highway down here, it's not a big deal, because you still have the other sides of Elliot Bay / Lake Union / Lake Washington / Puget Sound to look at...but this is the *central* waterfront. I think of Chicago's amazing lakefront bike path/excellent public spaces/beaches and dream of something along those lines for Seattle. I could go on, but ultimately I'm a newcomer who, unfortunately, compares everything to NYC (where I lived before here), and honestly I wish I could turn off that part of my brain. Standing at the lookout point by Pike Place Market, at Victor Steinbruek park. Mt. Rainier was partially out, completing the view. I enjoy the challenge of trying to capture the feeling of lots of cars going past - in this case by drawing some in water soluble media, then running a water brush over it to fade them out, then drawing on top of that to simulate a long exposure in photography. I'm showing this one & the very first piece at a Viaduct-themed show at the newly opened Phantom Realms gallery, which is appropriately located under the Viaduct (for now!). 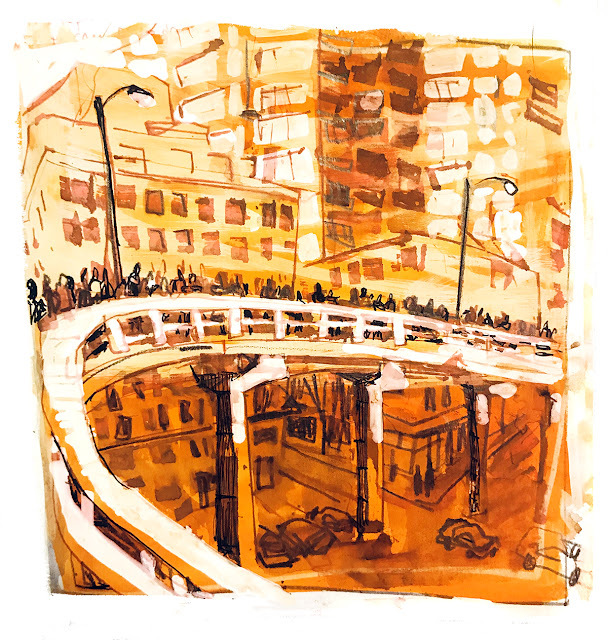 The opening is on Thursday 2/7 (Pioneer Square artwalk night). Standing under Seneca St ramp in an empty parking lot. So many good, dynamic views around this thing, maybe I'll make it back for a final sketch before they remove it! I bet the people who live/work in these buildings can't wait for this highway to go away. I'm sure this stretch will look really different in 10 years. Betting on there being several more luxury apartment buildings than there are currently. Like many of us, I went to the festivities on Alaskan Way. I was expecting long queues and crushing crowds, but it wasn't that bad - I appreciated that even though you were supposed to reserve a ticket to enter, the staff weren't even checking for them by the time I got there. 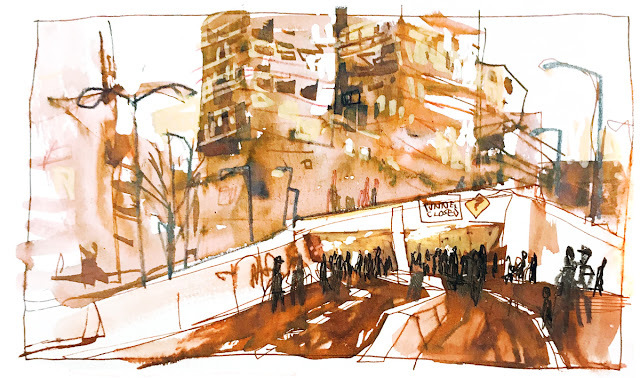 I entered at the north hub by the old tunnel and had to wait for my companion, who I accidentally ditched as we biked over, so I sketched the pedestrians entering & leaving the tunnel. It was kind of surreal. The feeling I got was : why can't it always be this nice? The event was a good time. I thought the curation of the art pieces was very thoughtful and represented the best of Seattle culture. Everyone seemed just down to appreciate the views and the interesting perspectives of spots you only get a glance of when you drive on this route. I saw people spray painting inside the old tunnel, and others hacking at the potholed pavement with chisels and pliers to attempt to take pieces of it away as souvenirs. It seemed to not work very well. I kept overhearing folks wishing we could somehow keep the viaduct and tunnel and repurpose them into...a pedestrian/bike-friendly path! a High Line style elevated park! a mushroom farm (the tunnel)! I get that it's not safe in the event of the Big One but it still seems like a big waste to just throw away these huge infrastructure projects. A final sketch while my companion waited in line at the port-a-potties. The special vantage of looking at the Seneca St. ramp from the highway! I kept thinking: "this moment is special. it will never happen again." I really felt like part of the city today at this event. Everyone has their own memories and experiences with this thing - for many Seattleites, it's been around their whole lives, and the nostalgia is totally understandable. I just hope with its removal, something substantially better can replace it.